Corky earned her name early on due to her quarky personality and happy-go-lucky attitude. Originally a left-over, we soon knew that we had quite a girl in our hands. 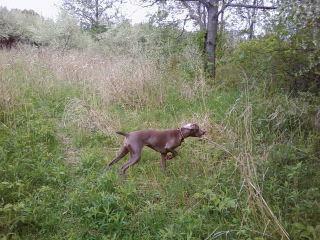 Her love for retrieving and eagerness to please add to her independence and ground speed afield. At her first field trial, Corky placed 3rd in an All-Breed Amateur Walking Derby stake and received multiple compliments on her run in Open Puppy as well. People couldn't believe she had just turned 6 months old. Unfortunately, due to a serious shoulder injury, Corky was laid up on bed rest since shortly after her debut. She was finally cleared for take-off in time for the Weimaraner Club of Tennessee Valley's Field Trial and ran her way into 4th place in a highly competitive Amateur Walking Derby stake! She continued to tear it up with multiple placements in all-breed Puppy and Derby stakes, has earned her Puppy points and was ranked as a 2010 Weimaraner Club of America Top Ten Derby Dog for 6 months. Corky has since been retired from field competition as it was putting more strain on her shoulder than we liked. She still loves to go hunting, easily earned her Junior Hunter title and is an awesome partner with that same old quarky Corky attitude that keeps up smiling!